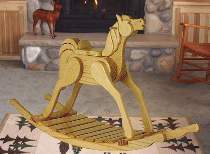 This is our largest rocking horse ever. It can be ridden by an adult! Or build it to decorate a living room or den. Project is made from standard lumber sizes. We used 3/4" and 1-1/2" pine. Order one birch dowel for grip handle separately below. Measures 45"H x 72"L. All patterns drawn FULL SIZE.